Should you get a new SUV? The new BMW X3 is a slam dunk according to SUV lovers. Drivers have said that this is the vehicle to beat in the luxury compact SUV market, and US News & World Report agree. You can find that this vehicle got a superb safety rating, as well as high marks in interior, performance, and reliability. You can expect to go far and carry everything oyu need with the superior cargo space in this luxury SUV as well. 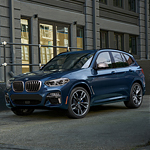 While many would say that compact SUVs can’t get fuel efficiency and power, BMW X3 does just that with its base trim. You’ll get 245 horsepower with the base trim, and that scales up to 350 in the more performance-driven models. While not all are able to get the best gas mileage, you can expect an average of 30 mpg on the highway in one of these. The X3 has been totally redesigned. Why not stop by BMW of Chico to take a look? You could be driving a new BMW.